In a paper published in the journal Monthly Notices of the Royal Astronomical Society, astronomers report catching the V404 Cygni black hole while it was shimmering and emitting red flashes, some of which were shorter than a timespan of only 1/40th of a second. In June 2015, V404 Cygni abruptly started emitting a huge amount of power, becoming one of the brightest objects in the Milky Way Galaxy as seen in X-rays. Telescopes worldwide, including the William Herschel and Isaac Newton Telescopes, followed its ascent in brightness for about two weeks, leading up to June 26, after which the black hole gradually faded away. Imagine an object 9 times larger in mass than the Sun, which repeatedly flares to up to 1000 times brighter than our Sun for a fraction of a second. This is the power that was seen to be emitted. As if this weren’t extreme enough, on June 26, the black hole appeared to be agitated and flickering red at high speed. Gandhi also comments: “The very high speed tells us that the region where this red light is being emitted must be very compact. Piecing together clues about the colour, speed, and the power of these flashes, we conclude that this light is being emitted from the base of the black hole jet. The origin of these jets is still unknown, although strong magnetic fields are suspected to play a role." The inset shows a still image showing one of the frames, only 1/40th of a second in exposure time, with a red flash, as observed by the ULTRACAM fast imager on the WHT in the early morning hours of June 26, 2015. 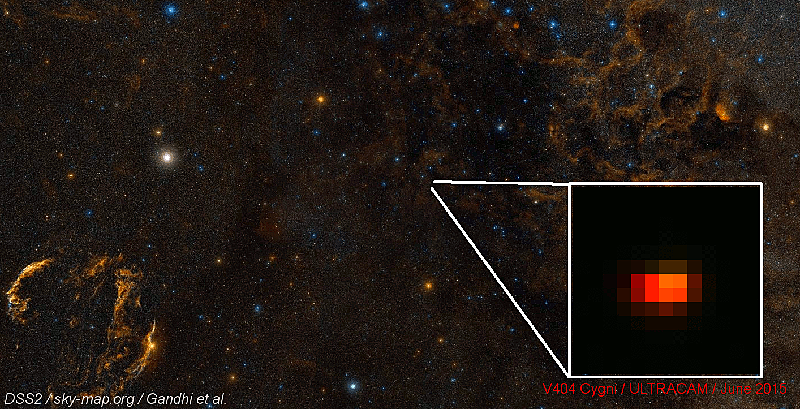 Click on the image above to see a movie of fast red flashes from V404 Cygni. A ~6 second segment of the ULTRACAM movie is repeated continuously. The flashes are incredibly short and last less than one second, with some of them being even faster than 1/40th of a second. The flashes are equivalent to a luminosity of about 1000 times the Sun's power. The background image shows a region of the sky in the Cygnus constellation, with the Cygnus Loop supernova remnant on the bottom left [ animated GIF | PNG ]. At a distance of 7800 light years from Earth, the black hole is too far away to image its jet in fine detail. But the speedy red flashes were important clues telling the astronomers that such a jet had formed. These observations are state-of-the-art, and could only be carried out with the fast ULTRACAM imager, which happened to be mounted on the WHT in June 2015 for about one week, just in time to catch the flurry of activity. Liam Hardy, PhD student at the University of Sheffield, and an ex-ING student support astronomer, said: "It was difficult to catch these signals from V404 Cygni in the small gaps in our scheduled observing, but when we finally spotted the fast flaring activity on our last night, it was tremendously exciting. We knew immediately that these observations would be of great interest to the community." The nature of V404 Cygni system was unveiled in 1992, when observations made using the telescopes of the Isaac Newton Group provided the strongest observational evidence for the existence of a stellar-size black hole in our Galaxy. P. Gandhi et al., 2016, "Furiously Fast and Red: Sub-second Optical Flaring in V404 Cyg during the 2015 Outburst Peak", accepted for publication in MNRAS. Paper: arXiv:1603.04461. "Astronomers see black hole raging red", movie and image. "Astronomers see black hole raging red", Southampton University press release, 16th March 2016. "Astronomers see black hole raging red", RAS press release, 16th Mar 2016.